Keyboard Maestro 6 introduced new actions (and a few tokens) to control Safari and Chrome. In this first part of the tutorial we'll look at these actions and see what can be done with them and how (more specifically we'll see how to fill out and submit basic forms). In the second part, we'll look into using these actions for more advanced purposes. If you're a web developer, you probably don't need most of it, but some info about KM itself might still be useful to you. If you're not a developer but have some understanding of how HTML works, then this tutorial was made for you. Finally, if you have no idea at all of what happens behind the scene when you view a web page, then Controlling Safari will make sense to you, but you might want to read some introduction to HTML (such as the one at w3schools.com) before going to Controlling the current page. The actions for Safari and Google Chrome are distinct (and can be found respectively in the Safari Control and the Google Chrome Control categories), but except for the application they control, they're completely identical. In this tutorial we'll use Safari, but everything could be transposed to Chrome simply by selecting the equivalent actions from the Google Chrome Control category. Opens a new window in the current space (optionally loading an URL that can come from a variable). Creates a new tab in the current window (optionally loading an URL that can come from a variable). Selects the next tab (next to the right) in the current window. Selects the previous tab (next to the left) in the current window. Selects a tab by its position (accepts variables) in the current window. Loads a new URL in the current window or tab (also accepts variables). Everything here is pretty obvious and shouldn't require any extra explanation. These actions are focused on the contents of the current page (that is the page in the current window or tab). Changes the title of the current page shown in the title bar and in the tabs bar. Note: keep Title empty to display the url instead of a title. Useful when you want to do something in the page once it's done loading (more about this action later). Looks for a link by its text in the current page and simulate clicking on it to load the document it points to. Locates a field and gives it focus (useful if you want the field to have focus so you can start typing immediately). Select the contents of a text field (field of type text, email, date, number, password, etc.). Reads into a KM variable the contents of a field. Sets the value of a field to a string or to the contents of a KM variable. Note: works also with select elements (popups and lists) as long as you give it the value, not the text. Empties out a given form. Evaluates to the title of the current webpage. Evaluates to the URL of the current webpage. Evaluates to the readystate of the current webpage. Note: the value can be either "uninitialized", "loading", "interactive" or "complete". More info about what they mean here. Evaluate to the current value of the targeted field. So let's see how to use these actions, then. But fIrst, do you see the Develop menu in Safari's menu bar? If not, open Safari preferences window, click on Advanced, then check the "Show Develop menu in menu bar" checkbox. We won't be using that menu, but enabling it also enables the "Inspect Element" command in the contextual menu, and we are going to use this one. You should see it at the bottom of the contextual menu when you do a right-click (or ctrl-click) anywhere in a web page. If you're using Google Chrome, the Inspect Element item should always be enabled and present in the contextual menu. Click this link to open that test page in a new window. OK, I guess that requires some explanations (if not, you can jump to Building the macro). Now you may wonder why I said that forms means the first element of the first form. Why is it not forms? This is because unlike us humans, who start counting from one, computers start counting from zero in most cases. So forms references the first item of the forms collection (that is the first form) and forms references the first item of that form's elements collection (that is its first element). Similarly, forms would reference the second element of the second form and forms would reference the fourth element of the second form. Makes sense? Safari selected the line corresponding to the field you clicked in, and as you can see, that input tag has an id attribute set to "first_name". Look for the opening tag of the form that contains this input tag, and you'll see that it also has an id attribute, set to "form_one". 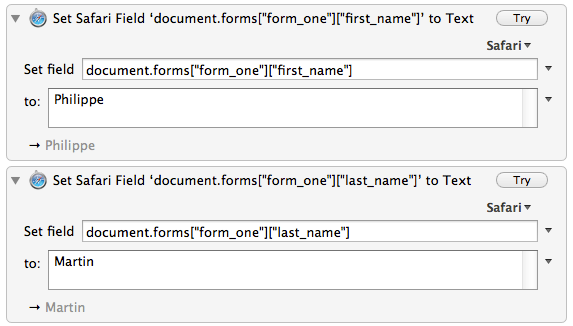 Now look again in KM's Safari popup and notice that the first item reads forms["form_one"]["first_name"] (text). See how the identifiers match? That literally means the field whose identifier is "first_name" of the form whose identifier is "form_one". Clearly, it's the one we clicked into. Note that if the id attribute is found in the element, its value will be used as identifier. If it's not found but a name attribute is, the value of the name attribute will be used as identifier instead. However in this case the name might not be unique and that would require using a combination of identifier and index. Both notations, by index and by identifier, are interchangeable. So forms["first_name"] or forms["form_one"] would be equally valid and would both reference that same field. The reason why KM defaulted to using the notation by index in Set field is because it didn't analyze the page when you inserted that action into the macro; instead it just used a hardcoded example of what the reference might look like. If there was no form in the page, that suggestion would still be the same but it wouldn't reference anything. Also, in this case the Safari popup wouldn't open, since it would be empty. So when should we use one rather than the other, then? Well, it depends on the web page. When all the forms and their elements have an id attribute, it's definitely better to use those identifiers because they are required to be unique. If you use the index instead, the day the webmaster adds to the page a new form that appears earlier in the DOM than the one you were targeting is the day your macro stops working. Because it will then target the wrong form. On the other hand, if a form or an element has no identifier (it happens), you'll have no other choice than using the index. Yes, that's right, the page doesn't actually contain one form, but three of them (or at least three that have a field this action can set). The DOM references "form_one" (which we already saw), "286219_497867", and "third_form". You might have noticed that there are three submit buttons on the web page, but it doesn't necessarily mean there are three forms. It could have been a designer's choice (admittedly not a very good one) to have a single form with three submit buttons. 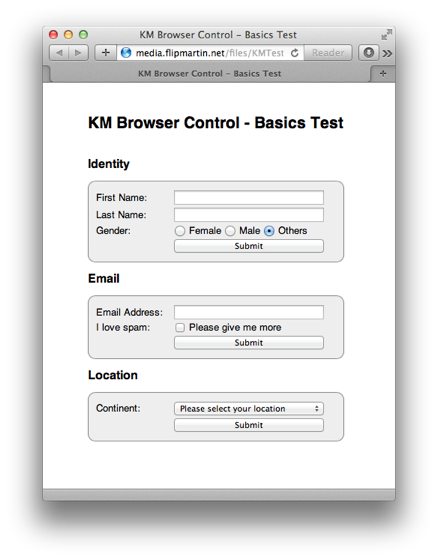 Alternatively, KM could show forms or elements that are not visible on the page. For example if you click the Safari popup in KM when the present page is frontmost in Safari, you will see references to a login and a registration forms that are not visible in the page (they only become visible when you click on Login/Register at the top and on Sign Up in the login form). However if they appeared in the DOM before the form you wanted to target, referencing this form with forms wouldn't produce the intended result, because that would target the wrong (hidden) form. The important point to remember, here, is that it's not enough to consider what you see in the page when you want to target a given field. You must either look at the source code of the page, or have KM doing it for you when you click the Safari popup. You could also have started the macro by temporarily inserting a "Submit Safari Form" action into it. Its Safari popup would have shown you immediately that the page contains three different forms. OK, back to our macro, then. The implication of having three forms instead of one is that the macro will need three submit actions. And if each submit causes the page to reload (which they do, I can tell you), we'll have to fill out and submit each form in turn rather than filling out the three forms at once before submitting them. But now you may wonder why KM found only one gender element when there are three radio buttons. That's because radio buttons in a same group are required to have the same identifier. This is how pressing a radio button automatically releases the previously pressed one so you can only have one radio button pressed at a time. You can see that the input tag for Female has a value attribute set to "1", the one for Male has a value attribute set to "2", and the one for Others has it set to "0". So that's where KM got those from. And it makes obvious which one you'll want to select in the action. Also, notice that KM displays the values in the same order they appear in the DOM (and in the page), and more importantly, notice that it displays the value of the currently selected button at the bottom left of the action. If you remember these, you won't have to look at the source anymore. If you select "value" in the popup, KM will display a text field where you can use a variable or another token (a calculation token, for example, would allow you to use a function). In these cases, though, make sure the result of the evaluation is a string, spelled exactly as it appears in the DOM. At this point you can take the web page back to the front, close the html inspector, and trigger the macro. The first three fields should be set to the values you chose. OK, so now we want to submit the first form. Insert a "Submit Safari Form" action, and set it to target document.forms["form_one"] (we saw earlier that "form_one" is the identifier of the first form). And since we know that will cause the page to reload, we'll want to make sure the page is done reloading before we start filling out the second form. This is done with the "Wait For Safari to Finish Loading" action. So insert one of these after the submit action. Note that it's not just a simple delay, though. KM detects when a page is done loading by looking at the document.readystate property and at the browser's Stop button. And if at least one of these shows that the page starts loading again before the delay time you've set has elapsed, KM resets its counter and starts waiting again. At this point, running the macro would fill out the first form and submit it. Well, actually in this case it would just reload the page because the form tag has no action attribute giving the browser the URL to post to, but in a real website it would. So you'd probably want to disable the submit action for now (by pressing the √ button below the actions pane) and enable it only when you've tested the whole macro. Or you could start the macro with an action that sets a variable (for example "debugging") to 1, and enclose each submit action into an "If Then Else" action to execute it only when that variable is set to 0. This way the submit actions wouldn't be executed until you were done testing and you set the variable to 0 in the first action. Since the first visible element in the second form is Email (a text field), insert a "Set Safari Field to Text" action at the bottom of the macro. By now you've learned that the next thing to do is to click its Safari popup, so go ahead and do it. The third element shown by KM in the popup has weird identifiers, though: forms["286219_497867"]["286219_497867_34077"] (email) Why is that? Many web pages are dynamically generated, including the forms they contain, and depending on the framework that does the job in the backend, identifiers can be dynamically generated too. And in some cases, they will look as cryptic as these. So you may have to make sure your choice references the field you expect (although in this case it's easy because "(email)" tells you that the type of the corresponding input element is "email", and since there's only one field labelled Email in the page, chances are good that this is the one). Again, use the Inspect Element command from the contextual menu in Safari to view the source corresponding to this field. And indeed, it will confirm that you want to target the field with the identifier 286219_497867_34077 of the form with the identifier 286219_497867. You can also type something into the field, and see if KM displays it at the bottom left of the action. If it doesn't, you're targeting the wrong element. Add an email address to the "to:" field and you're done with this action. Next we have a checkbox. So insert a "Set Safari Checkbox" action into the macro, and again click its Safari popup. KM detects only one checkbox in the page, so we can be pretty sure it's this one (besides, the form identifier shows that it is in the same form as the email field). Unlike Set Safari Radio Button, this action shows "checked" and "unchecked" in the "to:" field, so again the choice is easy. If you select "value" in the popup, the number selection field will be replaced with a text field where you can use a token to evaluate a variable. However note that in this case you'll have to set the value to the string "0" for unchecked or to the string "1" for checked. Now whether you want to check that checkbox or not is your own choice. But if you don't, you won't need an action for it at all. Since it's unchecked by default in the webpage, without an action modifying it, this checkbox will just stay unchecked. So now we just need a "Submit Safari Form" action and a "Wait for Safari to Finish Loading" action. Select those you inserted for the first form, copy them, paste them at the bottom of the macro, and update the submit action to make it target the second form. The third form only contains a popup menu. But where's the "Set Safari Popup Menu" action? Well, there isn't one, because the "Set Safari Field to Text" action can do it (remember the forms["third_form"]["continent"] item you saw in the Safari popup earlier? that's the one). So insert a "Set Safari Field to Text" action at the bottom of the macro, and set it to target forms["third_form"]["continent"]. As you see, each item in the menu appears as an option tag. And each has a value attribute, set (for most of them) to the lowercased name of a continent. So from the DOM's point of view (which KM adopts), there is no option tag whose value is the capitalized "Europe". This is why you'd actually have to type "europe" into the "to:" field. When you target a select element (popup menu or list box) never trust what you see in the page. Instead, always check the actual value. An easy way to do so is to select an item in the popup menu, bring KM to the front, and look at the bottom left of the "Set Safari Field to Text" action. The value of the item you selected will be displayed there. Finally, we need a "Submit Safari Form" action, so insert one, make it target the third form (document.​forms​["third_form"]), and temporarily disable it. That's it. Try running the macro, and it should fill out the three forms (but not submit anything until you enable the submit actions). Then enable those submit actions and try again. This time the page should reload after each submission. This concludes the first part of this tutorial. Thanks for reading this far! We have explored the various actions KM provides for controlling the browser and its contents; we've seen how to locate, reference, and set the basic form elements, along with submitting forms; and what we learned should allow us to do the same with the form elements we didn't encounter here. The forms we worked with are pretty basic, and they don't really represent the kind of stuff we'd want to do on a real website, but in the second part of this tutorial, we'll use the knowledge we acquired to put together much more complex macros, the kind we'd want to use for real. Go to the Second part.